Images and text by Amy Christie for Design Mom. The school year is ending and it’s time for last-day-of-school parties, and gifts for teachers, coaches, librarians and school bus drivers. I’m sure this (free!) 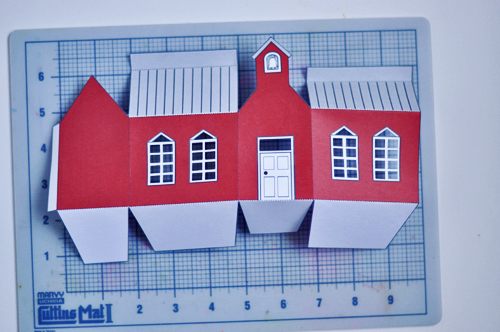 printable school house gift box would be gladly received by any educator (or non-educator) on your thank you list! Remember this house gift box from Christmastime? 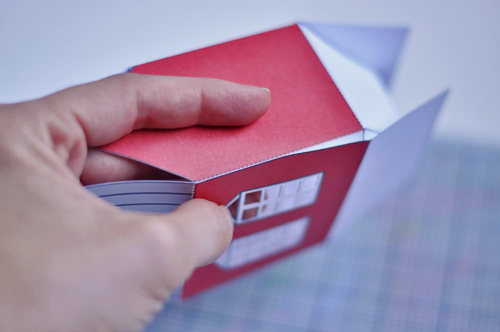 Well, this schoolhouse gift box is just as easy to construct — simply print, cut, fold, and secure with tape. 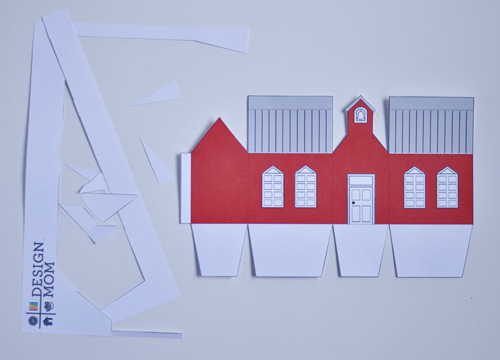 Choose from the yellow or red school house, or use the white version and add tissue paper in your school colors. Then fill with treats or small gift! By the way, Design Mom readers are just the best ever! It’s thanks to a reader suggestion this gift box came to be. (Thanks Fiona!) I love hearing from you with suggestions for projects and gift ideas you’d like to see. Let’s get to making these cute things! 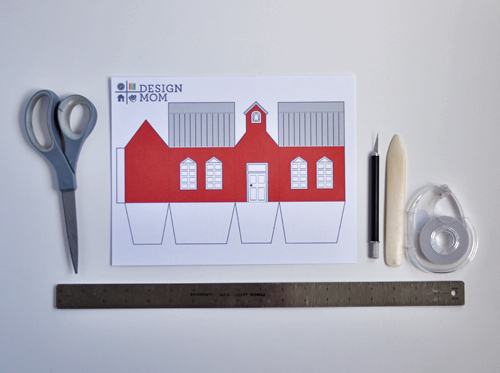 Print the school house gift box template. Cut it out. If you desire, use the cutting blade to remove the window panes and around the bell. 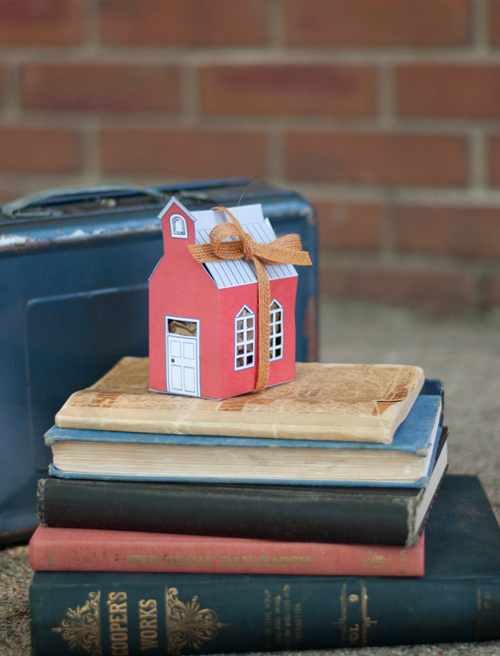 This little place of learning has a lot more windows that the holiday house box but I tell you, it’s so cute this way. Luckily, if you don’t feel up for it, it’s very cute as is as well. 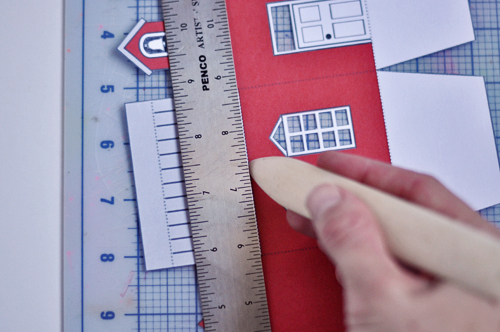 With the ruler and scoring tool, score the house template on all the dotted lines. Fold on the newly scored lines. Add a piece of double-sided tape to the small tab and connect it with the other side of the house, as seen above. Fold the bottom flaps in and use double-sided tape to hold it closed. Fill the box with a few small treats, a small gift or a thank you note. Add one more piece of tape to the top flaps and pinch the roof closed. 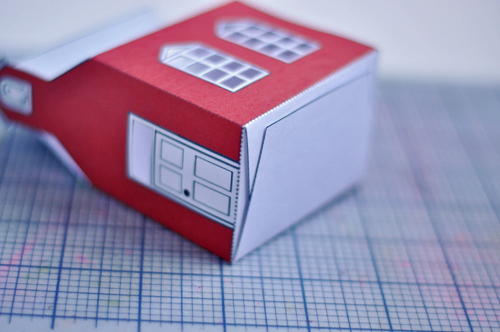 You can also loop ribbon through the roof flaps and close the box that way. Then show those teachers how amazing they are! – Party favors at a school themed or ABC themed party. – A class room project for kids. 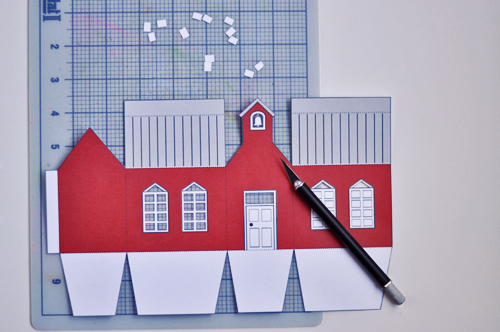 – To make a little paper village. P.S. — We love making gifts! Find all the posts in this series here. These are so adorable that it hurts a little. Squealworthy! Ridiculously cute! Thanks for the template. Perfect. Thank you so much for responding to my suggestion. And I just finished making the gifts – sleep masks so teachers can sleep in a bit on those bright summer days. this is the gift that keeps on giving – my 4 year old has decided that these are perfect sheds for his trains – so I am going to make him a few i think if I just cut off the bell tower they will look pretty good. These are perfect – and so EASY! I am so excited to fill these up and give them away. Thank you, thank you – my gift card and candy will look so cute! I am definitely going to use these! I’ve been trying to find the perfect end-of-year gift for my kids’ teachers. Thank you!! I love the idea, it’s really cute! Thanks for sharing! Such a clever idea – thank you! I’ve shared it on All Things Paper’s Facebook page. Wonderful blog! I found it while browsing on Yahoo News. Do yoou have any tips on how to get listed in Yahoo News? Thank you; very fun site, I’m even impressed by the advertising! As soon as I saw the school house it thought it could also double as a church! Thanks for this “dual duty” container. It is lovely, and it seems easy to put together, thanks for the template.